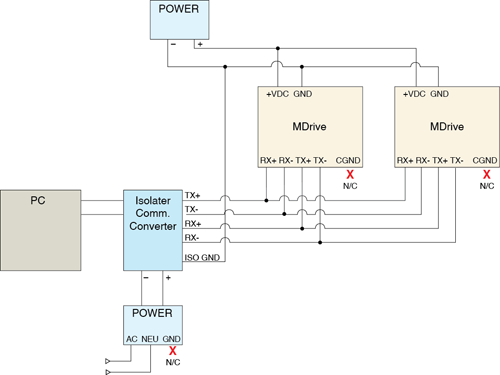 Multipoint communication using RS422/485 has always offered challenges. With MDrive Motion Control devices, when used in Party Mode (PY=1), the device may have unwanted recirculating currents in the common line of the communication port. These currents may manifest themselves as communication errors or in some cases hardware failure. Careful wiring practices and a few tips can eliminate these currents. 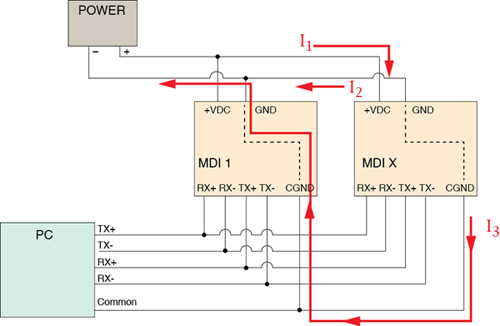 The motor power supply input common (GND) is connected internally to the common of the communication port. When two or more units are connected in the party mode, or multi-drop configuration, a “ground loop” is created. This occurs because the common (communication ground) which connects the communication ports of all connected devices is in parallel with the system power common. This can allow the motor power current to flow through the communication port of another device and vice versa. Figure 1 shows this recirculation where I1 represents the total current, I2 is return current through the power ground path, and I3 is the current recirculating through the communication ground path. Connecting the isolated ground of the communication converter direct to power ground. Leave the communication ground pin on the device open. Communications will still be grounded via power common without the path for recirculating currents. Figure 2 shows an example of this connection scheme.